I read this today and it got me thinking. I’ve never been a big believer in the “pills for anything that ails you” philosophy. I’ve never been a drug user or really a big drinker either so maybe it is that sort of lifestyle that informs this? It could also be what I do for a living which involves a heavy amount of pessimism regarding vendor claims and marketing spin. Whatever it is I have no faith that you can achieve meaningful weight loss with a pill and I’ll go even further based on what I’m learning, I doubt they can even assist you in it. The best of them have a placebo effect and are harmless and others have such terrible side effects you might want to just stick with being heavy. I think the bottom line is the only way to really get to where you want to be is to eat less, eat better and move more. That’s it. I know, I know, I know, I used to always read that sort of thing and think “no way, too hard, can’t do it” but I swear it really is that simple. I was never really taught much about nutrition growing up, there wasn’t a lot of that sort of info around (I’m old so this was pre-internet days) and anything that was around was almost cult-like. I was very set in my ways and just doing whatever I wanted. Once I realized I was doing almost everything wrong, I simply changed it. I didn’t attach a lot of emotion to it and I didn’t try to make it sound like I was horribly punishing myself, I just did it. Believe me I didn’t want to, I wanted to just take a pill and make it all better but the world simply doesn’t work that way and neither does your body. In addition all the pills out there tell you they don’t work anyway if you don’t alter your diet and exercise. I’ve recently taken to walking along the lakeshore where I live with my two dogs, it’s the easiest exercise ever. I do it about three times a day on the weekends and twice during the week. I lift some weights when my insides aren’t rebelling and currently do very little cardio (bad lungs). The whole process takes less than an hour, now don’t tell me you don’t have an hour to spare. One day I will post my schedule and you’ll see how that’s simply not true, you can find an hour for yourself in your day if you really want to. There are no easy fixes and everything worth doing or having requires some work and effort. I’ve always applied that philosophy to my work life and now I’m starting to apply it widely to my real life. It is strange but good. Wife made a surprise for dinner. Lettuce wraps. Brown ground sirloin, add a teaspoon of Walden Farms Asian dressing, fresh garlic and onions. When nearly done add bamboo shoots and water chestnuts. Top with the Asian dressing and serve on or wrapped in lettuce. Awesome treat. Chop zucchini and eggplant, put in a dish, coat with olive oil and season with black pepper, garlic, ginger and just a sprinkle of brown sugar (I use the Splend Brown Sugar Blend), toss vigorously. Put in a grill-safe basket and place over wood fire, stirring/moving around frequently to avoid major burning. Once veggies are tender, serve. 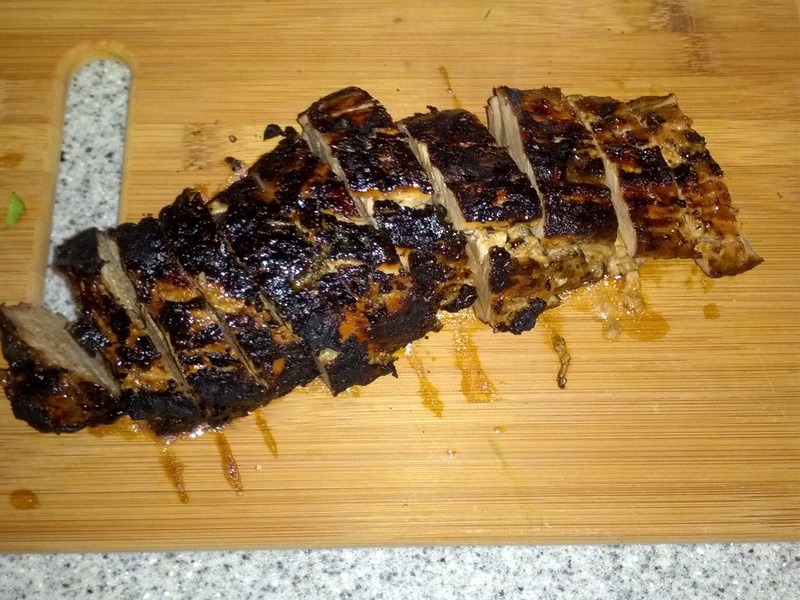 I think the next time I’m going to make a sauce to go with them but they were pretty good this time, here they are with my previously posted Teriyaki Pork Tenderloin Enjoy. Acquire some pork BBQ rub or simply use some asian spices as a rub (I used ginger, black pepper and dry mustard) and rub down the tenderloin then marinade (12 hours or so) in low sodium teriyaki sauce in the fridge. Get some fire wood, start a fire (fun for pyros everywhere) and a grilling grate. I use a triangle camping grill over a fire pit. Sear the tenderloin, then move from direct heat to allow thorough cooking. Cook until done safely. Recently my wife and I acquired a fire pit and while I have cooked with wood on occasion (wood-fired pizza can’t be beat) it’s not something I have done on a regular basis. Seriously, what was wrong with me? Yesterday I accidentally used wood because I couldn’t get the charcoal hot enough and was too lazy to go to the store and buy more. 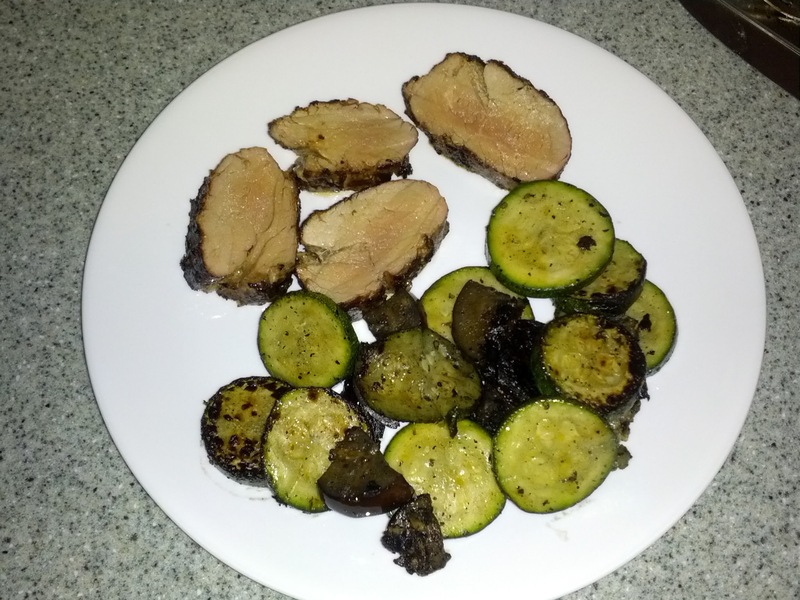 I made some grilled zucchini and eggplant and teriyaki pork tenderloin (recipes coming) and I tell you it was some of the tastiest stuff I’ve ever grilled. More to come on wood cooking as I experiment and get better at it. Saute turkey sausage in butter substitue (Olivio, yum) until nearly done, add asparagus, red onions, mushrooms and cook until tender. When all that is about done add a teaspoon of olive oil, fresh garlic, salt and pepper, add in spinach and cook down. This will mix all the flavors together REALLY nicely. In a mixing bowl whisk six eggs together until not bubbly (sorry don’t know the technical term). In a cast iron (my favorite) or other oven safe pan, coat with a little Olivio and add about 1/2 the egg mixture, cook on medium until the eggs have started to set. 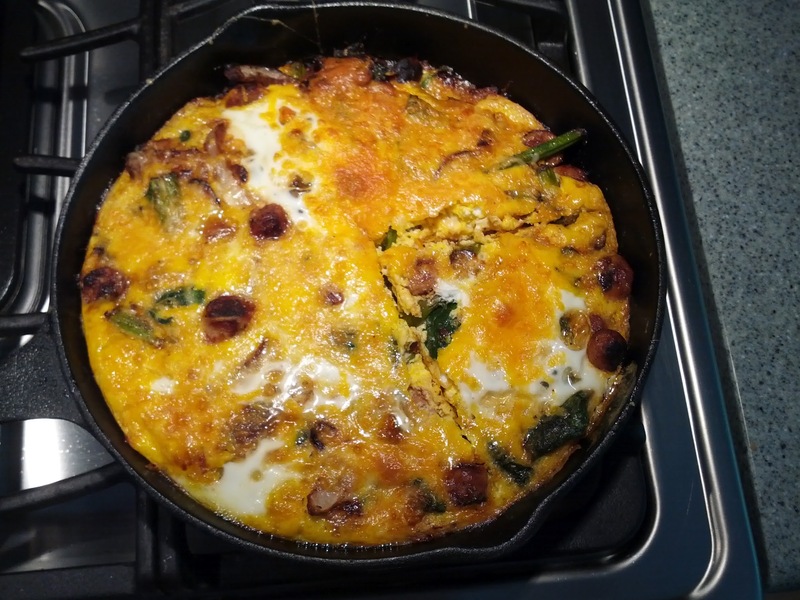 Once the eggs have start to set a bit, add in the sausage/veggie mixture evenly to the top, then cover with cheese and the rest of the eggs. Top with cheese if you wish and then bake in oven at 350 for about 25 minutes or until everything is done all the way through. 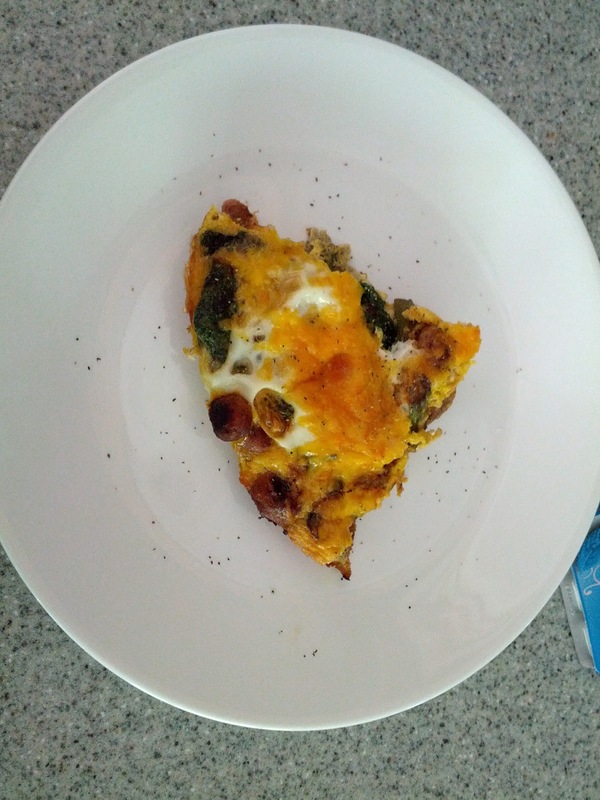 This was my first frittata and even my picky wife (she knows it) liked it. I will definitely be trying more of these. Hope you enjoy. You are currently browsing the Geek Cooks blog archives for June, 2012.